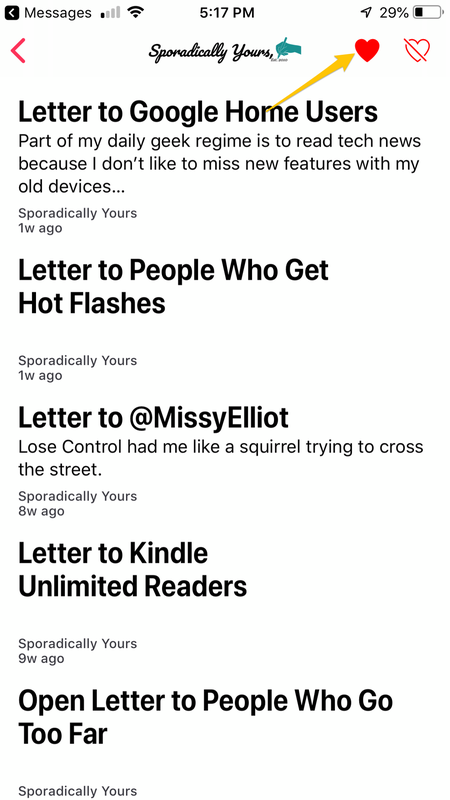 I have a channel on Apple News. I applied for it a long time ago. It was a process. I don’t know if it was because it was fairly new at the time, but it seems like it took a couple of weeks for me to get approved. I signed up because with Apple News you can earn some revenue while sharing your blog posts, but I never followed though with the advertising part. Right now my channel is still ad-free. 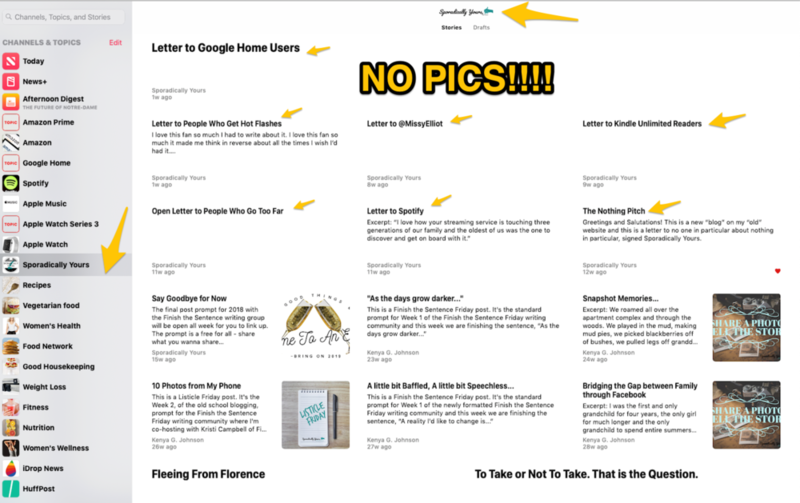 I thought my posts would be a needle in a haystack until I actually saw my link to the letter I wrote to Google Home Users on the Google Channel and then again on the Spotify Channel. You should have seen my jaw drop when I saw it. I was like, “Hey that’s me!” Then I saw why pictures are VERY important. No picture, no thumbnail. Still kind of a needle in a haystack. Dang. Hopefully I’ll get to be in the spotlight again after some strategic SEO-ing with pictures. 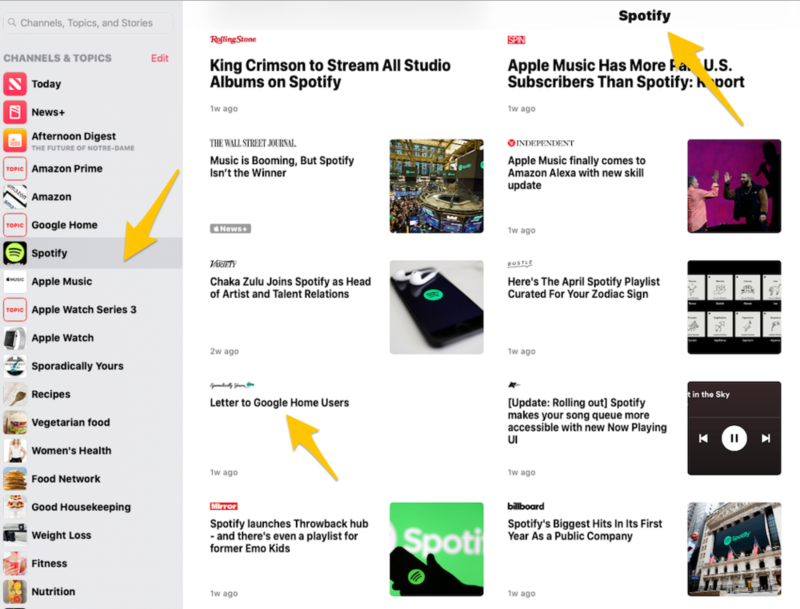 Apple News just came out with Apple News+. I hope that doesn’t take away from reading for free. You’ll see all the channels I follow above and there’s plenty more to choose from. So I’m not interested in the magazines and stuff; just the occasional articles to get my tech fix, look at some recipes and get fitness advice. I’m still loving my Kindle Unlimited subscription, that’s enough. Then all you have to do is remember to check it. Connect your CMS (follow the instructions) this is what you’ll add to your website so it will automatically publish to News. Lastly if you want to earn revenue, complete all the necessary info under Advertising. Be patient. It’s a process! So that’s it. Y’all know these are my FAVORITE types of posts to write. I am SUCH a nerd when it comes to this kind of thing. If you stuck with me to the end LOVE YA! If you’re my dad, you never saw this line. I love you anyway. P.S. I redesigned my website. I lasted a few years with the other one. It was time for a new look and I’m double branding now. Still Sporadically Yours, but also SY|K looks more business like. Check out my homepage, it’s pretty cool!